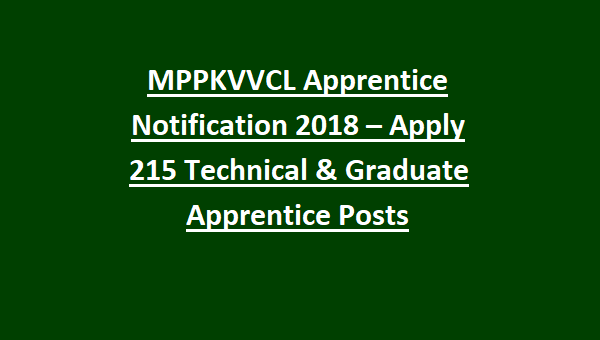 MPPKVVCL Apprentice Notification 2018 – Apply 215 Technical & Graduate Apprentice Posts: MPPKVVCL Diploma/Graduate Apprentice Notification 2018. MPPKVVCL Technical Apprentice Notification 2018. 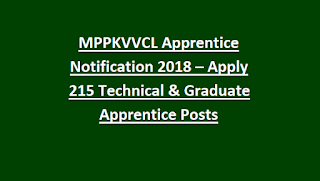 The Madhya Pradesh Poorv Kshetra Vidyut Vitaran Company Ltd (MPPKVVCL) has released apprenticeship training notification for Diploma or Engineering Graduates for the recruitment of 215 Technical & Graduate Apprentice Posts. For MPPKVVCL Apprentice Notification 2018 age limits are applicable As per MPPKVVCL guidelines. Candidate selection for this Apprenticeship Program of Madhya Pradesh MPPKVVCL Apprentice Recruitment will be through merit in qualifying examination. There is no application fee for MPPKVVCL apprentice vacancy. Candidates who are qualified B.E /B.Tech or Diploma in ECE or EEE and having interested to get trained by MPPKVVCL as an apprentice you can submit your application form on or before 31-10-2018. Candidates can download the application form from www.Mpez.co.in official website of MPPKVVCL. Fill the application form clearly and attach the all necessary documents. Candidates have to send the application form to the below given address.